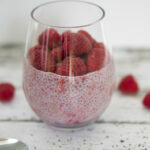 Add chia seeds and raspberries to jar and secure lid. Shake until seeds are mixed in. Allow seeds to plump for 6 hours.